This airticle is aboot the filosofer an statesman. For the 20t century penter, see Francis Bacon (airtist). Portrait o Francis Bacon, bi Frans Pourbus (1617), Palace on the Watter in Warsaw. 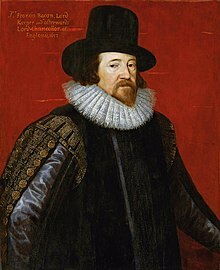 Francis Bacon, Viscoont St. Alban[lower-alpha 1] Kt PC QC (/ˈbeɪkən/; 22 Januar 1561 – 9 Apryle 1626), wis an Inglis filosofer, statesman, scientist, jurist, orator, essayist an author. He served baith as Attorney General an as Laird Chancellor o Ingland. Efter his daith, he remeened extremely influential throu his warks, especially as filosofical advocate an practeetioner o the scienteefic method in the scienteefic revolution. Bacon haes been cried the faither o empiricism. His warks argued for the possibility o scienteefic knawledge based anerly upon inductive raisonin an carefu observation o events in naitur. Maist importantly, he argued this coud be achieved bi uise o a sceptical an methodical approach whaurbi scientists aim tae avoid misleadin themsels. While his awn practical ideas aboot sic a method, the Baconian method, did nae hae a lang lastin influence, the general idea o the importance an possibility o a sceptical methodology maks Bacon the faither o scienteefic method. This merked a new turn in the rhetorical an theoretical framewark for science, the practical details o that are still central in debates aboot science an methodology the day. In addeetion tae his work in the sciences, Bacon wis an aa a venerable patron o leebrars an developed a functional seestem for the catalogin o beuks bi dividin them intae three categories- history, poesy, an filosofie- that coud forder be dividit intae mair speceefic subjects an subheidins. Bacon wis generally neglectit at coort bi Queen Elizabeth, but efter the accession o Keeng James I in 1603, Bacon wis knichtit. He wis later creautit Baron Verulam in 1618 an Viscoont St. Alban in 1621. [lower-alpha 2] Acause he haed na heirs, baith teetles becam extinct upon his daith in 1626, at 65 years o age. Bacon dee'd o pneumonia, wi ane accoont bi John Aubrey statin that he haed contractit the condeetion while studyin the effects o freezin on the preservation o meat. He is buiried at St Michael's Kirk, St Albans, Hertfordshire. ↑ Thare is some confusion ower the spellin o "Viscoont St. Alban". Some soorces, sic as the Dictionary of National Biography (1885) an the Encyclopædia Britannica (11t ed., 1911), spell the teetle wi "St. Albans"; ithers, sic as the Oxford Dictionary of National Biography (2007), spell it "St. Alban". ↑ Contemporar spellin, uised bi Bacon himsel in his letter o thanks tae the keeng for his elevation. Birch, Thomas (1763). Letters, Speeches, Charges, Advices, &c of Lord Chancellor Bacon. 6. London: Andrew Millar. pp. 271–2. OCLC 228676038. ↑ Fowler 1885, p. 346. ↑ "Empiricism: The influence of Francis Bacon, John Locke, and David Hume". Sweet Briar College. Archived frae the oreeginal on 2013-07-08. Retrieved 21 October 2013. ↑ Adamson (1878), p. 200. ↑ Wilson, Scott. Resting Places: The Burial Sites of More Than 14,000 Famous Persons, 3d ed. : 2 (Kindle Locations 2105-2106). McFarland & Company, Inc., Publishers. Kindle Edition. Fowler, Thomas (1885). "Bacon, Francis (1561-1626)". In Leslie Stephen. Dictionary o Naitional Biography. 2. London: Smith, Elder & Co. pp. 328–60.